How Can I Protect My Evergreen & Shrubs From MN Winter’s Ice and Snow? Your flowering shrubs that provide you with beautiful flowering blooms throughout the spring and summer need care to survive Minnesota winters. And then there are the evergreens that give shade and beauty year round. Do you know how to protect them from the snow and the ice that come our way? Winter here in the Minneapolis area can be hard on landscape plants, evergreens and those that go into hibernation mode due to the cold weather. It’s important to protect the shrubs and ensure that you can enjoy their flowering blooms when the weather warms up again. So when it comes to whether or not you should protect those flowering shrubs during the winter, the answer is yes. Do I Need to Protect My Evergreens in Winter? Yes, you’ve probably thought about protecting your roses and hydrangeas and have already mulched and covered them. But then there are the evergreens such as arborvitae, cedar, yew, and others. Evergreens are usually the shrubs that are forgotten when it comes protecting landscaping from the ravages of winter. They are often left uncovered and unprotected. They keep a low profile in your yard and you may think they don’t warrant this extra care; however, you should make sure that you give them the attention that they deserve and protect them from the winter snow, frost and ice. But doesn’t that mean you won’t get to enjoy their beauty during the colder months? In short, the more protection you give them over the winter, the less you’re going to be able to see them during this time. But the less you protect them so that you can enjoy them, there is a concern about them becoming damaged by the cold and ice. You’ll need to evaluate your evergreens and the look you desire to have in your yard to find the balance. If the evergreens are in an area that isn’t seen much in the winter, then by all means go for maximum protection. First, make sure to winterize them correctly by using an adequate amount of water. 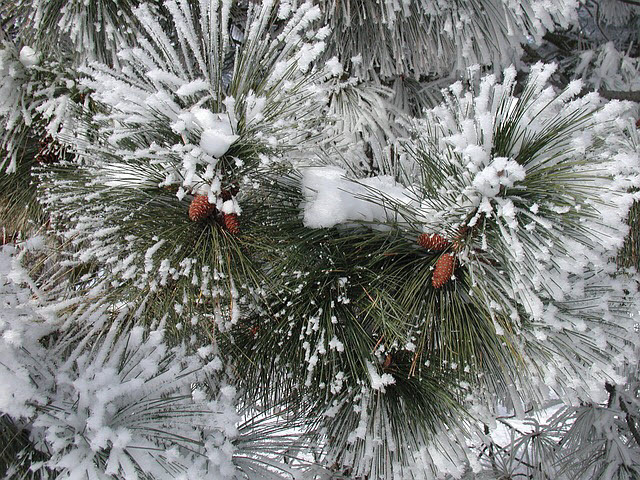 Winter can really dry out evergreens, resulting in what’s called ‘winter burn.’ Even though it’s cold, evergreens can lose a lot of moisture through their foliage. Spraying them down using anti-dessicants such as Wilt-Pruf or Vapor Guard can protect the outside of the plant. This should be done before the temps drop to below freezing, and then again during a mid-winter thaw. Be sure to read and follow label directions. In addition to spraying them, you can either wrap them in burlap or cover them with structures that will shelter them from the elements. Putting up a screen behind your shrubs will deflect some of the wind and snow but still let you enjoy their beauty. It’s also important to protect the trunks from hungry critters such as rabbits who come looking for a meal. You can apply tree wrap to the trunks, or some homeowners use a mesh screen. Now is the time to find out more about winterizing your landscape, or even planning ahead for your new landscape projects. Talk to us here at Architectural Landscape Design to find out how you’ll be able to protect, plan, design and then get the landscape you’d like. It is also a great time to get your holiday lighting installed. For a free consultation, call us at 952.292.7717.